Michigan summers really bring the heat at times, so it’s no surprise when tenants seek out rental properties fitted with an air conditioning system- or pass on those without some form of air cooling unit. Powering air conditioning costs property owners $ 11 billion annually, and nearly 2/3 of all US homes have some type of air conditioner. 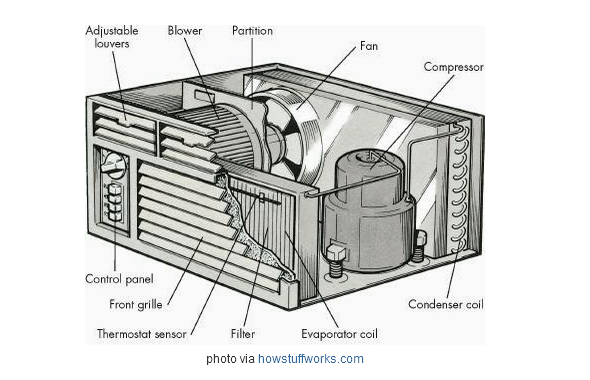 And while air conditioners should be serviced by heating and cooling professionals, property owners and tenants alike can benefit from knowing a little more about air conditioners, how they work and what makes them more effective. 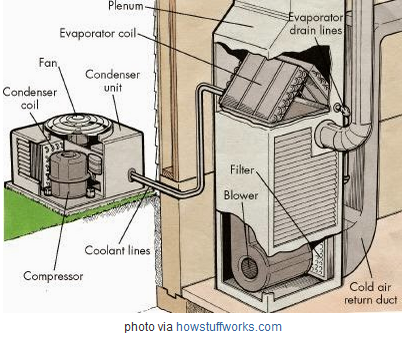 Condenser (usually on a concrete slab outdoors): It contains the compressor, coolant lines, condenser coil and fan. In a nutshell, hot air from the home goes in the return duct, then is blown over the cool evaporator coil (cooled by refrigerant ) and delivered through the air ducts. The warm air is directed outdoors via the fan in the condenser unit. To avoid any a/c issues, regular inspections of the unit by professionals is recommended. Also, trim away any weeds, long grass or vines that may obstruct the outside condenser unit. During the fall and winter seasons, protect the condenser unit with a proper cover to avoid ice damage and leaf blockages. An alternative to central air is the window unit, which works like central air on a smaller scale without using the air duct system. Window units are cheaper to run (if used efficiently) than central air, but due to their small size are only capable of cooling one or a few rooms or small areas. Window units too large for a room can also be inefficient and result in “clammy” air. * Energy-Star window units are up to 50% more efficient than a standard model and provide a shutoff feature that maintains the coolness of a room without running constantly. The best way to maintain a window unit is by cleaning and/or replacing the air filter regularly. Close off any gaps in the window space to keep cool air from leaking out. A split system: Mounted on the wall, this type provides zoned cooling minus air ducts. Evaporative Coolers: These cool air using evaporated water, which is then dispersed throughout the house. Natural Ventilation/Fans: Opening windows and assembling fans is the cheapest way to cool people. Fans do not cool rooms themselves, so turn them off when no one is in the room.